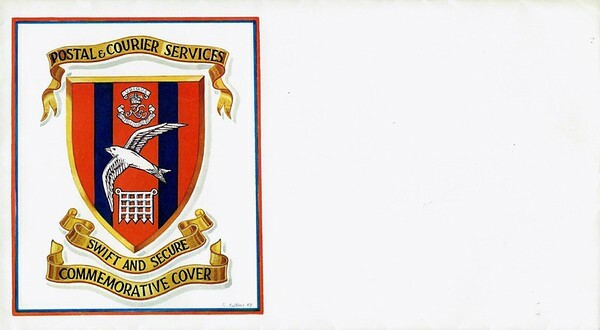 Covers issued, commissioned by or sponsored the R.E. R.E. Day 1959 Forces Air Letter By Air mail par avion Stamps: 3ᴰ Wilding definitive, deep lilac. Circular Date Stamp: Field Post Office 234, 23 MY 59. Note. The Field Post Office number 234 was opened for one day only. Especially for the 1959. R.E. Day held at Camp Polymedia, Lymmasol in, Cyprus. 23 May 1959 R.E. 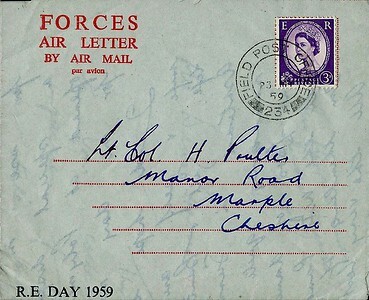 Day 1959 Forces Air Letter By Air mail par avion Stamps: 3ᴰ Wilding definitive, deep lilac. Circular Date Stamp: Field Post Office 234, 23 MY 59. Note. The Field Post Office number 234 was opened for one day only. Especially for the 1959. R.E. Day held at Camp Polymedia, Lymmasol in, Cyprus. 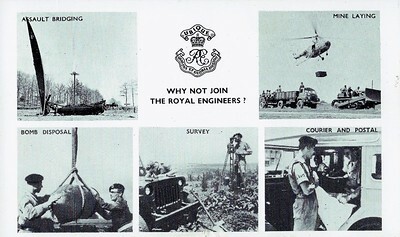 Recruiting Card Description: Royal Engineers badge in the centre. 4 images surrounding the badge depicting activities of the R.E. Back of Card: Stamps: 2½ᴰ Wilding definitive, carmine red. Circular Date Stamp: Field Post Office 1020, A 2 DE 60. 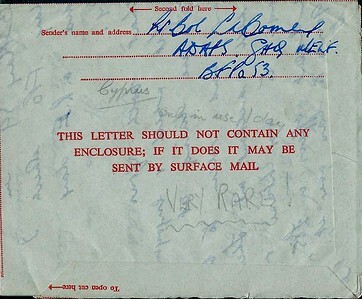 Note: The back of the card as issued is blank so that it can be used as a postcard. Royal Engineers Association Special Handstamp Envelope Stamps: ½ᵈ and 2½ᵈ Wilding definitives, orange-red and carmine-red. Special Handstamp: Royal Engineers Association Jubilee Rally, Royal Festival Hall, RE badge in centre. 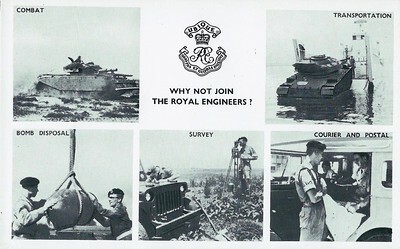 Why not join The Royal Engineers Recruiting Card (Combat version) Note: With the "Combat version" the top two photographs have the theme of "Combat" and "Transportation". With the "Assault Bridging" version the top two photographs have the theme of "Assault Bridging" and "Mine Laying". 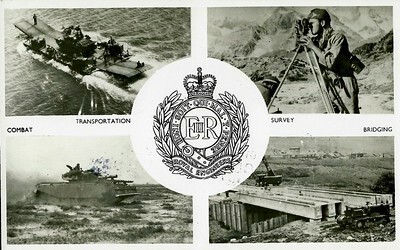 Why not join The Royal Engineers Recruiting Card (Assault Bridging version) Note: With the "Combat version" the top two photographs have the theme of "Combat" and "Transportation". With the "Assault Bridging" version the top two photographs have the theme of "Assault Bridging" and "Mine Laying". 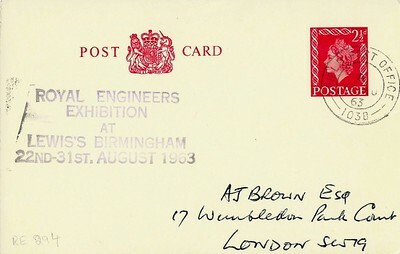 ROYAL ENGINEERS EXHIBITION AT LEWIS'S BIRMINGHAM Postcard Cachet: ROYAL ENGINEERS EXHIBITION AT LEWIS'S BIRMINGHAM, 22ND - 31ST. AUGUST 1963 Stamps: 2½ᴰ Wilding, pre-paid definitive, red. 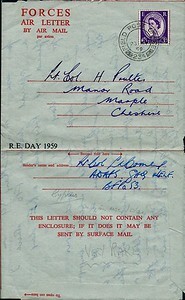 Circular Date Stamp: Field Post Office 1038, A 31 AU 10. Stamps: 3ᴰ Wilding definitive, deep lilac. Circular Date Stamp: Field Post Office 234, 23 MY 59. Note. The Field Post Office number 234 was opened for one day only. Especially for the 1959. R.E. Day held at Camp Polymedia, Lymmasol in, Cyprus.